One of the hardest parts of working on my MOC (My Own Creation) was shifting my brain to think at a Lego scale. I kept thinking of a (2 x 4 Lego) brick as comparable to a(n actual) brick. But if I had built at that scale, there's no way I could have fit my model into my carry-on luggage yesterday. I can't even count the number of times I did a Homer (hit myself on the head and cried, "Doh!") when I realized I was misthinking scale Yet Again. A 1x1 Lego brick (that means there's only one stud on top), is approximately one foot across in scale and just over one foot tall. I finally managed to wrap my brain about the difference in size and then I had a new shift in thinking that I had to cram into my brain. If I were recreating the Old Firehouse in popsicle sticks or paper maché or some other medium, I might be able to replicate some of the intricate details. But with Lego bricks, which aren't maleable or customizable beyond a certain point, my mantra really has to be to *approximate* the original building, giving a nod to the reality of the architecture. Then a guy named Steve posted a note in the Brickon Facebook group that they were putting together a micro-Brickcon in honor of Brickcon's 10th anniversary. That's when I decided that I should do a micro version of my Old Firehouse. Although standards seem to vary on micro builds, I suppose you could say the scale is something along the lines of every 20 ft x 20 ft area in real life is equivalent to a postage stamp's size in Lego bricks. It's a major shrinkage. 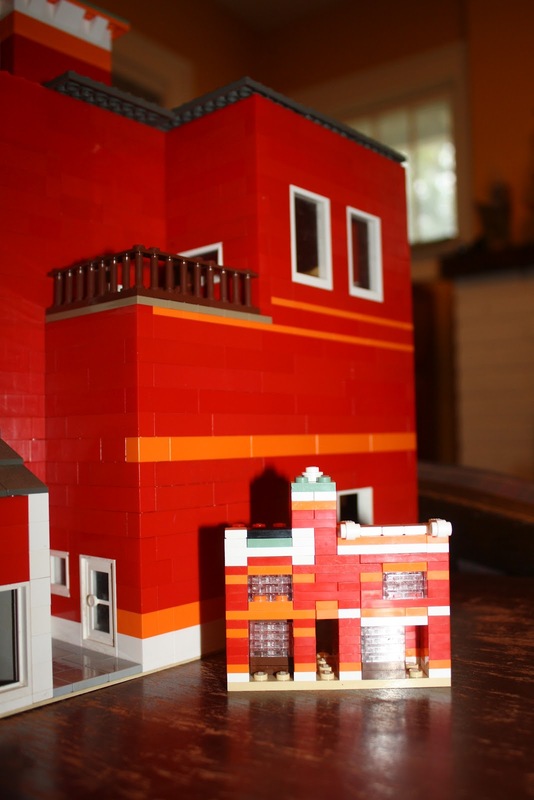 It was much easier making a micro version of the Old Firehouse than the larger version, but that's in large part because there's simply no way to include much detail. That's when I decided that a regular Lego model of an actual building is essentially a nod to the original. You can't get all the detail, but you find a way to represent as much as possible. When you shrink something down to a micro size, that's when you're not just giving a nod to the original building, but you're giving a nod to the idea of a nod. 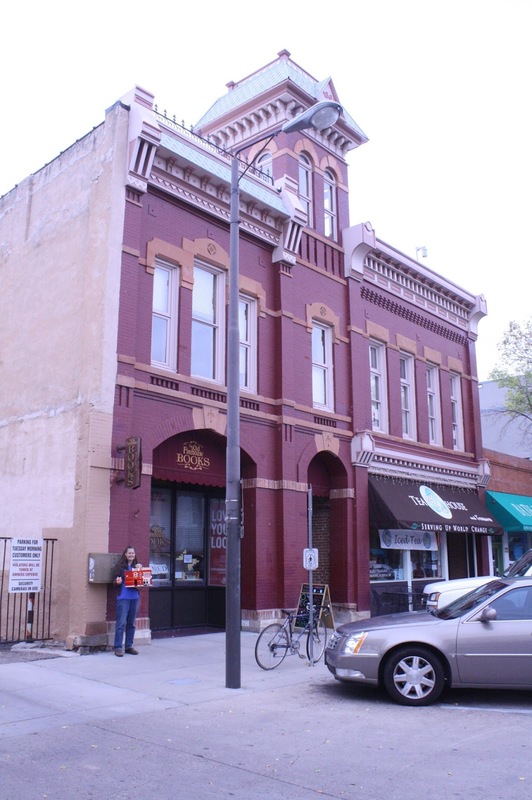 The micro building is a vague, but recognizable representation of the original. Here's a closeup of the micro version sitting behind the regular Lego scale version. I was able to keep basics such as color in the general areas where the color would go, and windows in the general area where windows would go. But details such as number of windows, arches over windows or doors, some bricks sticking out further than others, etc. is all lost to scaling. I did manage to fit my MOCs into a carry on suitcase. I wasn't sure if I'd be able to do it. I took the base plates off and bagged the parts that had been attached (bookshelves, minifigs, tables and counters). I took the roof pieces off as well as the tower. And then I turned the MOC on it's side (so the front of the building was facing down into the suitcase - which it's not doing here in this photo just yet). I stuffed clothes and food inside and around the edges. When I arrived in Seattle for Brickcon, I was pleased to see that most of the building was still holding its shape. I spent and hour this morning, however, picking up chunks of pieces that had fallen off and thinking, "Now where in the world does THIS go?" You would think that pieces would fall off in ___ shape and you'd think there'd be a _____ shaped gap left in the model. You'd then put the pieces in place a viola! your MOC is good as new. But I swear some pieces rearranged themselves or perhaps even reproduced themselves because there were some pieces that I never did figure out how to put back in and other pieces that I know I didn't have in certain places before. But the finished product looks basically the same so I'm rolling with it. I printed photos of the Old Firehouse so that people could compare the MOC to the original. This is my MOC on display in the architecture section of the Exhibition. It's looks rather barren right now. The table is ginormous but there's not currently enough models to fill it up. Hopefully someone has a few more tucked away in their back pocket to help round out the table a bit. The Exhibition starts tomorrow morning and will continue through till Sunday afternoon - October 6-7.
:-) It was really fun to work on this. I'd clear the dining room table, pull out all my bricks (That's what those in the know call them, not Legos. ;-) ) and puzzle out how it should all fit together. It was kind of zen. I'm looking forward to starting my next project. I need to buzz down to the Lego store (hopefully next week) and Pick-a-brick a bunch of tan pieces to look like stone work in the church walls. I'll see what else I can pick up while I'm down there, too.